In the last article, I explained how to configure DMVPN phase3, but what are the most useful commands to troubleshoot this type of network architecture? The “show dmvpn” and “show ip nhrp” commands permit to obtain the state of the tunnels. On hub router, all tunnels are dynamic (D attribute) because it waits the registration from spokes routers (“ip nhrp map multicast dynamic”). By default, the spoke routers have only static tunnel (S attribute) to the hub router (“ip nhrp map 10.0.1.1 17.17.17.1”). Note: Due to the static nature, the tunnel “never expire”. What happens when a spoke tries to reach another spoke? Dynamic tunnel are established. Then the hub “link” this traffic back onto the DMVPN network, triggering the NHRP process on HUB to generate the traffic indication to Spoke2 to resolve a better next hop for the remote network 192.168.3.0 (Spoke3). At this point, the spokes can modify their routing table entries to reflect the NHRP shortcut route and use it to reach the remote spoke. Note: DT1 attribute means that a dynamic (D) tunnel is established and the route is installed (T1). The second line is a Spoke3’s tunnel, the third line is an entry for the subnet behind Spoke3 and the last one it’s formed for the local subnet. Obviously, if the dynamic tunnel between two spokes are no more used, a counter will tear down the tunnels. This is defined by the command “ip nhrp holdtime”. By default, each 100 seconds a spoke sends NHRP registration requests to the hub. This value can be customized using the command “ip nhrp registration timeout”. The default value is one third NHRP holdtime value. To find more info about routing process, two show commands can be used: “show ip eigrp neighbors” and “show ip route eigrp”. The “show ip eigrp neighbors” displays EIGRP neighborship informations; in a DMVPN environment, the only eigrp neighborship are between hub and spoke and never between spoke to spoke, also when a spoke to spoke relationship is established. 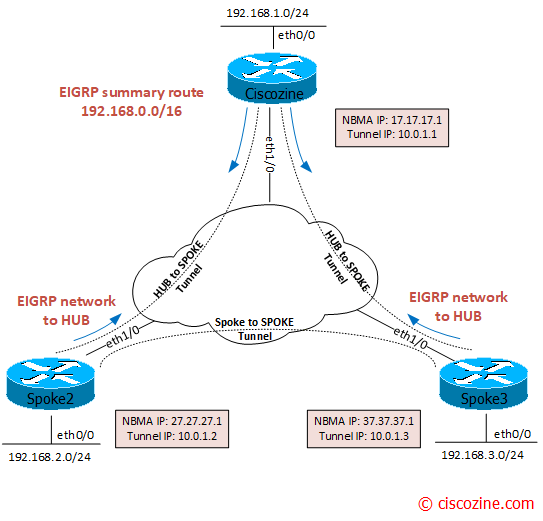 The “show ip route eigrp” shows route learned by EIGRP. In the hub router, there are all eigrp routes: the first one is made by the ” ip summary-address eigrp 100 192.168.0.0 255.255.0.0″ command under the hub tunnel interface, while the others are learned by the two spokes. On spoke routers, only one route is learned by the hub: the summary route. Remember: During spoke to spoke relationship, the spoke networks are learned by NHRP (H) process. And what about IPSEC troubleshooting commands? show crypto ipsec sa: shows IPsec Security associations built between peers and the number of encrypted/decrypted packets per tunnel. Note: Obviously, all the show commands can be used to analyze DMVPN Phase1 and Phase2, but the output can change slightly due to the different architectures.